A new approach to optical imaging makes it possible to quickly and economically monitor multiple molecular interactions in a large area of living tissue—such as an organ or a small animal; technology that could have applications in medical diagnosis, guided surgery, or pre-clinical drug testing. The method, which is detailed in Nature Photonics, is capable of simultaneously tracking 16 colors of spatially linked information over an area spanning several centimeters, and can capture interactions that occur in mere billionths of a second. "We have developed a smart way to acquire a massive amount of information in a short period of time," said Xavier Intes, a professor of biomedical engineering at Rensselaer Polytechnic Institute. "Our approach is faster and less expensive than existing technology without any compromise in the precision of the data we acquire." As its name implies, optical imaging uses light to investigate a target. In biomedical applications, optical imaging has many advantages over techniques such as MRI and PET, which use magnetism and positron emissions to acquire images inside of living tissue. The method the Intes lab developed makes use of advanced optical imaging techniques—fluorescence lifetime imaging paired with foster resonance energy transfer—to reveal the molecular state of tissues. 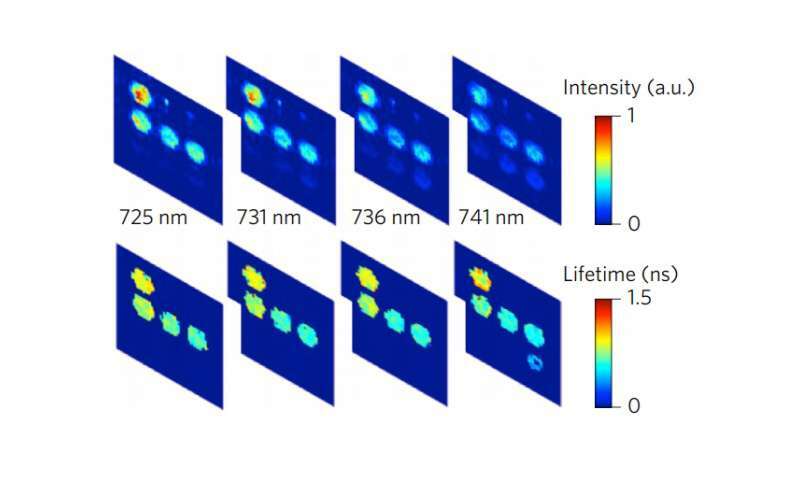 In fluorescence lifetime imaging (FLIM), molecules of interest are tagged with fluorescent "reporter" molecules which, when excited by a beam of light, emit a light signal with a certain color over time that is indicative of their immediate environment. Reporter molecules can be tuned to offer information on environmental factors such as viscosity, pH, or the presence of oxygen. FLIM is ideal for the thick tissues of a body because it relies on time information, rather than light intensity, which degrades significantly as it travels through tissue. Researchers also used Forster resonance energy transfer (FRET), which determines close proximity between two similarly tagged molecules - such as a drug and its target—based on an energy transfer that occurs only when the tagged molecules are delivered into the diseased cells for maximal therapeutically efficacy. However, while the FLIM-FRET method generates a signal rich in information, collecting that signal quickly and economically is problematic. Current methods rely on expensive cameras, which can image only one reporter at a time, and scanning the subject can take hours as the camera collects information from its full field of vision. To overcome this obstacle, the researchers dispensed with cameras and instead used a single-pixel detection method combined with a mathematical sampling technique (based on a Hadamard transform) that allowed them to collect sufficient relevant information in 10 minutes to construct a precise image. The detection method can collect information on 16 spectral channels simultaneously, and three detection devices positioned around the sample provided spatial information used to construct a three-dimensional image. "This is a new platform, a new option in macroscopy, and we think it will have traction in multiple applications in the biomedical arena," said Intes. Intes' research is enabled by the vision of The New Polytechnic, an emerging paradigm for higher education which recognizes that global challenges and opportunities are so great they cannot be adequately addressed by even the most talented person working alone. Rensselaer serves as a crossroads for collaboration—working with partners across disciplines, sectors, and geographic regions—to address complex global challenges, using the most advanced tools and technologies, many of which are developed at Rensselaer. Research at Rensselaer addresses some of the world's most pressing technological challenges—from energy security and sustainable development to biotechnology and human health. The New Polytechnic is transformative in the global impact of research, in its innovative pedagogy, and in the lives of students at Rensselaer. This is impressive and exciting. However, there seems to be a contradiction here between "interactions that occur in mere billionths of a second" and "a mathematical sampling technique that allowed them to collect sufficient relevant information in 10 minutes." Would the results amount to an average over the acquisition time?